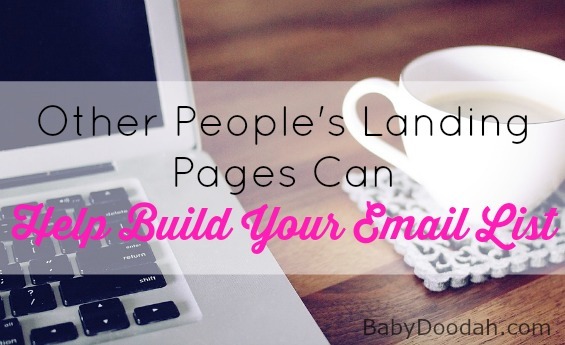 Other People's Landing Pages can Help Build Your Email List - Baby Doodah! Here we are at doable 25 of the ‘Build Your List with 30 Daily Doables’ Blog Tour. Yesterday we learned how to set up an opt in page on our website. It is definitely worth a read if you haven’t set on up on your site yet. A full list of the blogs we have already visited can be found at the the Blog Tour Information Page. Jillian O’Keefe is hosting us today. Thank you so much for having us visit along the way! This is not one I see a lot but it is actually a great little strategy. I am using this right now with one of my launches. I have Twitter training I am giving away as my free opt in. Once they have opted in I am letting them know about a 40 page PDF on Getting Started on Twitter that they can purchase for $7. With that PDF I offer two bonuses, and neither of them are mine. The first one is a ‘What to do if you get into trouble on Twitter’ guide. Which talks people through what to do if their account is hacked, that kind of thing. The other is a guide to creating graphics specifically for Twitter. You will notice that the bonus items I am offering are closely linked to my original products. I have affiliate links for both of these free bonuses. So when my people opt in for the trainings I am ‘cookied’ into their affiliate system. When those people go on to purchase something then I will receive a commission. If you know someone that has a product or a free gift that your free gift would be a match for then you can use this idea. Another thing you can do is offer your opt in as a bonus when someone is launching a new product. Your opt in will need to be something of high perceived value so people feel like they are getting something extra, on top of what they purchased. Thank you so much for hosting us on the tour!! Stacey Myers recently posted…Is Your Website Mobile-Friendly? It has been my pleasure!! Thanks for stopping by! Graphics for Twitter? What a clever idea! 😉 Though I’m not sure how to know if this giveaway, specifically, has added people to my list. But it definitely should spread awareness of my name and expertise. Thanks for stopping by, Louise! I’m sure low cost items work the same way. As long as they solve a problem, people will buy them! Thanks for stopping by! You are absolutely correct, Jillian. They can be low cost items – so long as they are a great resource.